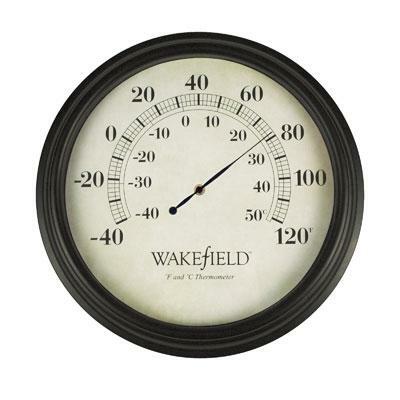 Large Dial Thermometer, Bronze Patina Finish Conant Decor Collection (decor colors selected to match outdoor furniture and hardware). 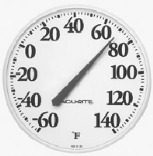 Large 8.5 inch anodized aluminum dial thermometer with glass crystal. Super-sized and excellent for viewing from a distance. Scale in Farenheit and Celsius, range from -30 to 130F. Includes reversible mounting arm & bracket, matching hardware. 10-year warranty. Thermometer can be calibrated. 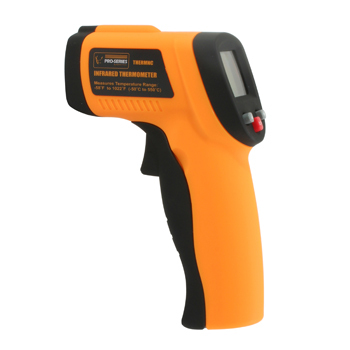 Get accurate temperature readings without touching the object when using the Pro-Series Infrared Thermometer. 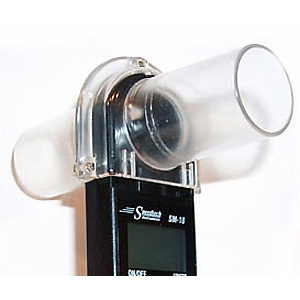 This device is great for measuring the temperature of hot water pipes, cooking surfaces, electrical connections, electric motors and bearings, or heating and air conditioning vents. 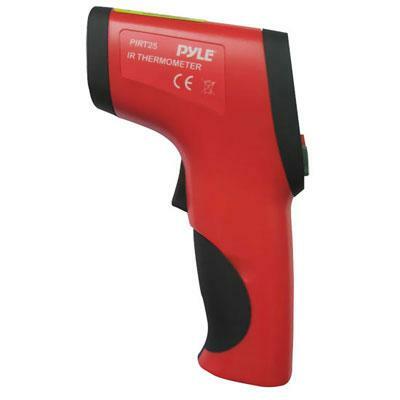 The Pro-Series Infrared Thermometer couldn't be easier to use. Just point it at the object, press the trigger, and the temperature appears on the screen almost instantly. The blue backlit LCD Display automatically holds the temperature reading when the trigger is released, and shuts off after 8 seconds to conserve battery life. Measures temperature ranging from -58 degrees F to 1022 degrees F ( -50 degrees C to 550 degrees C) within 1.5 degree accuracy. 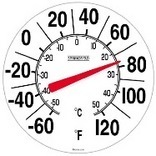 12-1/2" INDOOR & OUTDOOR THERMOMETER Acu-Rite 12.5" indoor/outdoor thermometer Features accurate, reliable temperature readings Weather resistant construction Integrated hang hole for easy mounting White face with black lettering & red indicator 01360 12 IN. 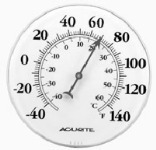 WH DIAL THERMOMETER SIZE:12"
Large Dial Thermometer, Solid Brass Finish Conant Vermont Collection Large 8.5 inch anodized aluminum dial thermometer with glass crystal. Super-sized and excellent for viewing from a distance. Scale in Farenheit and Celsius, range from -30 to 130F. Includes reversible mounting arm & bracket, matching hardware. Life time warranty. Thermometer can be calibrated. Taylor Station Thermometer and Clock - Displays a clock on one side thermometer o0n the other; durable metal construction; UV and weatrher resistamt paint; crystal clear glass lens; quartz clock movement; requires one AA battery not included This item cannot be shipped to APO/FPO addresses. Please accept our apologies. Conant Grande View Thermometer, 12.25 inch, Solid Brass Finish, Conant Vermont Collection . Solid Brass and glass, spirit tube thermometer. 12.25 inch tall x 2 inch dia. Life-time warranty. Clean lines and classic elegance in an easy-to-read size, temperature in Farenheit and Celsius, range from -40 to 120F. Includes mounting brackets and matching hardware. BIG & BOLD THERMOMETER Easy to read number tracks, pointers & hands Clear acrylic cover Easy to mount housing 90007 13.25 IN. 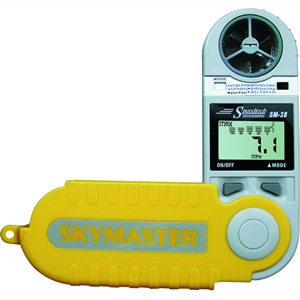 PATIO THEMOMETER SIZE:13.25"
Skymaster allows you to track weather in the palm of your hand! Radio/TV reports cover a large area, but Skymaster's data is specific to your location. Unlike other units, the jackknife case gives you the most accurate measurements--your hand's heat/moisture won't influence the environmental sensors. The Honeywell humidity sensor and the Swiss-made barometer can be easily re-calibrated and the unit has a weather alert if the barometric pressure rises or falls 6 millibars over 3-hrs. Skymaster can be tripod mounted using the optional tripod mounting fixture. 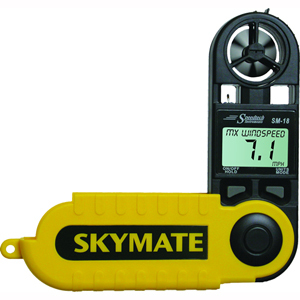 SM-28 wind meters are designed with a wind speed accuracy of better than +/- 3% and have a 2-Year warranty. Dial Thermometer, Solid Copper, Conant Vermont Collection . Solid Copper dial thermometer with glass crystal. 4.25 inch dial with reversible mounting arm & bracket. 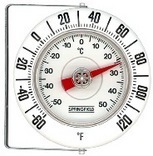 Scale in Farenheit and Celsius, range from -40 to 120F.Mounting hardware and screws included. Life time warranty. Thermometer can be calibrated. Songbird Essentials' large window thermometers are hand-carved from albesia wood. Each piece is hand-painted on both sides & coated with polyurethane to protect them from the environment. The thermometers are mercury free & read in both Farhenheit & Celsius. They are individually carded with barcode, product information & mounting instructions on the back. 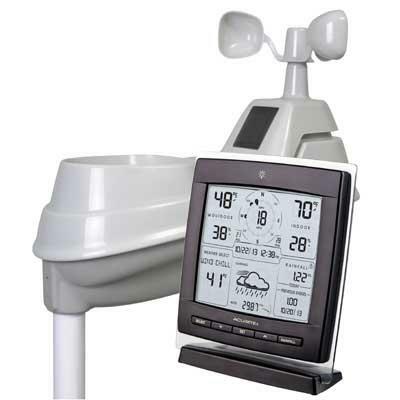 The AcuRite Pro 5-in-1 Weather Station with Wind and Rain. Plan the day with confidence with your own weather and weather prediction information - pinpoint accuracy right from your own backyard. The AcuRite Professional Weather Station uses patented Self-Calibrating Technology to provide your personal forecast of 12 to 24 hour weather conditions. Self-Calibrating Forecasting is generated from weather data measured by a sensor in your yard - giving you the most accurate forecast available for your exact location. Rain accumulation data recorded for today over all-time by year by month and by rainfall event; tracks days with rain this month and days since last rain. Wind speed: current peak and average (MPH or KPH). Wind direction with 16 point wind rose. Indoor and outdoor temperature (degrees Fahrenheit and Celsius) with trend arrow. Indoor and outdoor humidity (%RH) with trend arrow. Heat index wind chill dew point and "feels like" calculations. Daily weekly monthly all time high and lo This item cannot be shipped to APO/FPO addresses. Please accept our apologies. Conant Comfortmeter is designed to monitor both temperature and humidity, while featuring the important relationship between the two. The thermometer displays temperature in both Fahrenheit and Celsius on the left scale of the Comfortmeter, and the hygrometer shows percent of relative humidity on the right. The graphic design of the Comfortmeter shows the optimal range of temperature in yellow and humidity in blue. The ideal target comfort zone is represented by the green intersection of these two ranges. 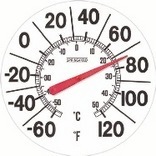 The Comfortmeter uses an easy-to-read 4 inch diameter dial mounted on a solid brass stand for stability making it great for monitoring heating or cooling zones, greenhouses, sunrooms or problem areas. The Comfortmeter may be used in combination with a humidifier or de-humidifier to maximize its benefits and your comfort. This unique weather instrument combines practical simplicity with timeless design. The solid brass housing of the Comfortmeter will never corrode, and the highest standards of craftsmanship have been employed to assure that this instrument will provide a lifetime of trouble-free service. 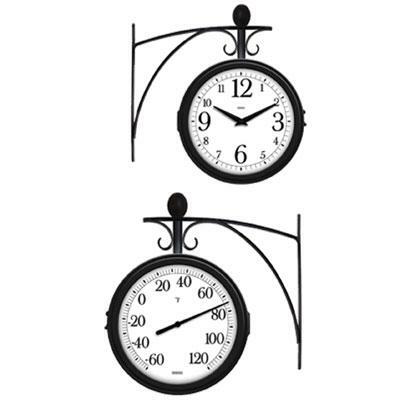 8" INDOOR/ OUTDOOR DIAL THERMOMETER Acu-Rite indoor and outdoor use thermometer Features accurate, reliable temperature readings Weather resistant construction Integrated hang hole for easy mounting White face with black lettering & red indicator 00353 8 IN. WH DIAL THERMOMETER SIZE:8"
Brighton Thermometer with resin frame and glass lens Thermometer reads in both F and C 16" diameter with large easy to read numbers. This item cannot be shipped to APO/FPO addresses. Please accept our apologies.